Cynomolgus CD16 (FC6-C52H9) is expressed from human 293 cells (HEK293). It contains AA Gly 17 - Gln 208 (Accession # Q8SPW2-1). The protein has a calculated MW of 23.9 kDa. 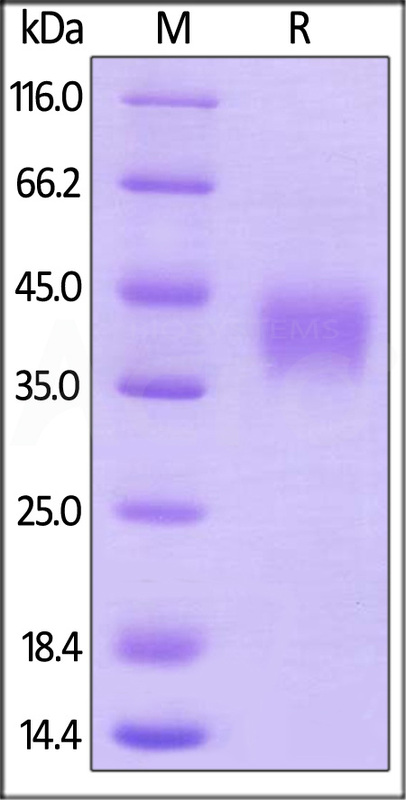 The protein migrates as 37-45 kDa under reducing (R) condition (SDS-PAGE) due to glycosylation. Cynomolgus CD16 on SDS-PAGE under reducing (R) condition. The gel was stained overnight with Coomassie Blue. The purity of the protein is greater than 95%. 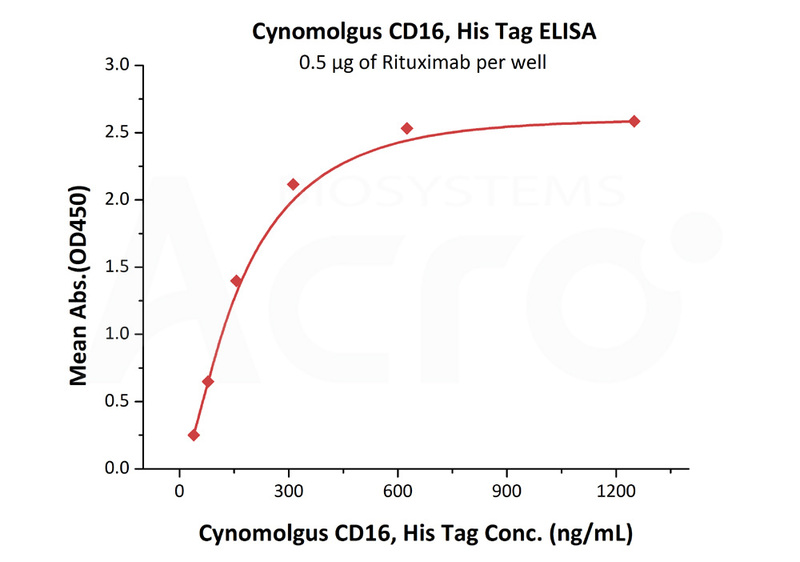 Immobilized Rituximab at 5 μg/mL (100 μL/well) can bind Cynomolgus CD16 (Cat. No. FC6-C52H9) with a linear range of 39-313 ng/mL (QC tested). CD16 is a low affinity Fc receptor, and has been identified as Fc receptors FcγRIIIa (CD16a) and FcγRIIIb (CD16b). These receptors bind to the Fc portion of IgG antibodies. CD16 encoded by two different highly homologous genes in a cell type-specific manner.CD16 is found on the surface of natural killer cells, neutrophil polymorphonuclear leukocytes, monocytes and macrophages. CD16a antigen is also known as Low affinity immunoglobulin gamma Fc region receptor III-A, Fc-gamma RIII-alpha. CD16b is a low-affinity, GPI-linked receptor expressed by neutrophils and eosinophils, whereas CD16a is an intermediate affinity polypeptide-anchored transmembrane glycoprotein expressed natural killer cells, macrophages, subpopulation of T-cells, immature thymocytes and placentaltrophoblasts.CD16a is involved in phagocytosis, secretion of enzymes and inflammatory mediators, antibody­dependent cytotoxicity and clearance of immune complexes. Aberrant expression or mutations of CD16a is implicated in susceptibility to recurrent viral infections, systemic lupus erythematosus, and alloimmune neonatal neutropenia. (1) Webster NL., et al., 2006, J Leukoc Biol. 79: 294-302. (2) Nagarajan S., et al., 1995, J Biol Chem. 270: 25762-70. (3) Ravetch JV., 1989, J. Exp. Med. 170:481.